As we eagerly approach the November 3 release date for ‘Love Comes Close’, in conjunction with The Heartworm Press, we are pleased to announce the following event. 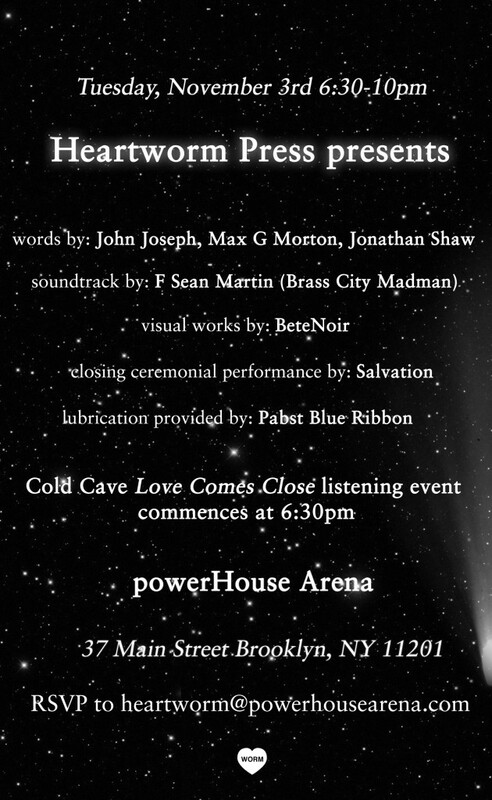 Tomorrow night, at powerHouse Arena (37 Main Street, Brooklyn NY 11201) in the D.U.M.B.O neighborhood of Brooklyn, Heartworm Press will be hosting a reading event that begins with a special listening party for ‘Love Comes Close’ (Cold Cave merch will be available and you’ll receive a free poster with purchase) As you may know, The Heartworm Press is a limited-edition book/zine publishing house run by Wesley Eisold of Cold Cave and Max G. Morton. This event, will kick off at 6:30 sharp with a playback of ‘Love Comes Close’ followed by readings by the Cro-Mags’ John Joseph, Max G. Morton and Jonathan Shaw. F. Sean Martin (Cage, Hatebreed) will be DJing with visual accompanyment by BeteNoir and the Philadelphia group, Salvation will close out the event. Be sure to RSVP to [email protected] – We’ll see you there!